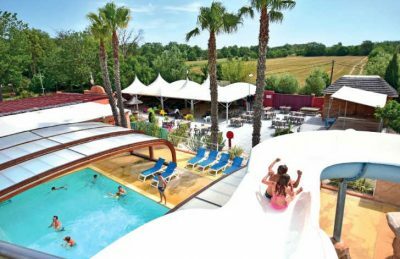 Camping Club l’Air Marin is a 4 star family friendly campsite which lies in a peaceful setting alongside the Canal du Midi away from the busy centre of Vias. The campsite is set within 17 acres of grounds which are styled on a Mexican theme. Pleasantly bright coloured buildings, plants, flowers and palm trees can be found throughout the campsite which makes for a great atmosphere. Those looking to make the most of their holiday will love some of the activities that are available on site. In addition to the regular activities it’s also possible to make use of the canal through canoeing, rowing and fishing. One of the great things about Camping Club l’Air Marin is its location. The centre of Vias is a short distance to the north whilst the stunning beaches are a little over 1.5km to the south. The beach is easily reached by foot or by bike in around 20 minutes and is covered in soft sand. Perfect for a family day at the beach you’ll have lots of fun playing in the sand, in the sea or simply sunbathing. The swimming pool complex at Camping Club l’Air Marin has it all. A lagoon styled swimming pool, indoor swimming pool, children’s pool with mushroom and bubble area, slide and plenty of sunbathing terracing backed by palm trees, perfect for a brilliant family camping holiday. Camping Club l’Air Marin is fun campsite with a comprehensive range of activities and facilities on offer to ensure you have a fabulous holiday. On site activities at Camping Club l’Air Marin campsite include tennis, table tennis, football, basketball, volleyball gym, boules, playground, canoeing, rowing boats and outdoor fitness area. Facilities available at Camping Club l’Air Marin campsite include WIFI, restaurant, takeaway, bar, groceries, animation team, games room, washers and dryers. Accommodation at Camping Club l’Air Marin includes a range of 2 and 3 bedroom mobile homes that are available from Eurocamp.